Manly-Warringah Wolves vs. UNSW Eastern Suburbs Bulldogs – Weldon Oval on Saturday, April 28, 2018. 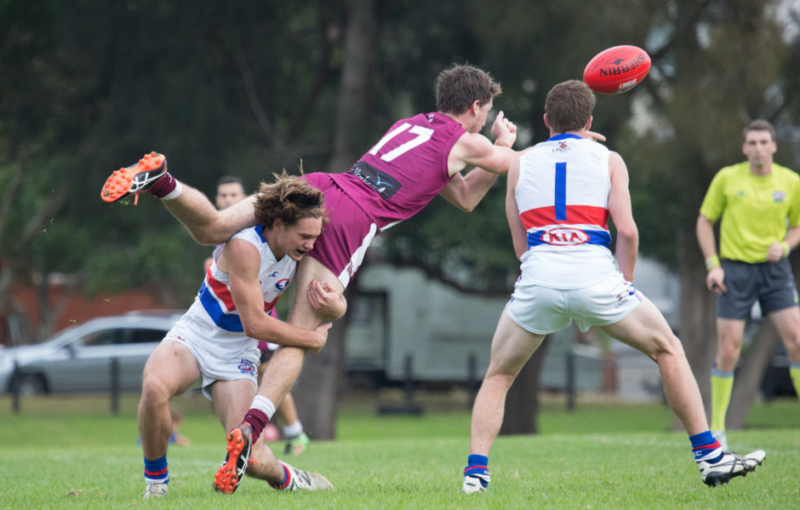 Manly and UNSW-ES faced off at Weldon Oval in a high-stakes contest. With both clubs going into the game with one win from their first three games, the loser would face the risk of losing touch with the top five. The game would be a low-scoring slog in overcast conditions, and little would separate the two sides in the first half. Just one goal apiece would be scored in a tight and tough opening term, a physical contest where packs would frequently form around the ball and loose crumbers were denied the opportunity to create space and forward pressure. The Bulldogs led by a point at the first change, but neither team was able to shake off the pressure of their opponents. Not much changed in the second quarter. A congested contest, it wasn’t a quarter of footy that had the aesthetic fanciers of the game enthused; but reflected the desperation of two teams short of their best form but determined to deny anything to their opponent. The quarter would yield two goals to one in favour of the Wolves, who led by four points at half time; but the game was still very much in the balance. But after so much pressure in the first half, something had to give. And in the third term, it was the Wolves who were able to break from the clutches of their opponents and carve out greater scoring opportunities. It was still a slog, but it had become one-sided, as the Wolves were getting a far greater share of the ball. The Bulldogs were left behind in the chase for possession, but although the Wolves weren’t always efficient with their disposal, weight of opportunities would make the difference as the Wolves added four unanswered goals to take a 26-point lead to three quarter time. Manly were on top, and continued their resurgence in the last term. Frustration would set in for the Bulldogs, as another game was slipping away. But this was the Wolves’ day, and a run of four goals to one would put the icing on the cake as they races away to a 45-point win. On a day when goals were at a premium, Tyrone Armitage’s four goal haul was worth its weight in gold. Armitage, along with Connor Pettersson and Jame Brain, was among Manly’s best. The Wolves have two wins and two losses, importantly they remain unbeaten at Weldon Oval and their home fortress remains a tricks visit for opposition teams. Tom Banuelos, Justin Cann and Kaia Reynolds-Erler were the Bulldogs’ best. But it was another lost opportunity for the Bulldogs. After two close losses and a win, the Bulldogs had gone into this game looking to build on the form of their round three result. Instead they find themselves well behind the ladder leaders, and will need to string some wins together to get back into contention.